It's not an easy process, being responsible for helping find a safe and pleasant living situation for an aging parent, spouse, or other loved one. Most people begin the process online, searching lists of communities in their area. And while this is a great place to begin, it can also bog you down, overwhelming you with the number of options, costs, and steps involved, and leaving you almost as confused as when you started. Once you step onto the grounds of a senior care community, though, things begin to come into focus. Instead of trying to read between the lines of other people's comments, you're relying on your own eyes, ears, and instincts. Touring the facilities, meeting the staff and residents, and watching the routine of daily life allows you to put your parent or loved one in the picture and ask yourself, "Can I see my mother here?" The large majority of caregivers do tour facilities before making a decision, but it may take a while to gear up for it. In an online survey of caregivers, 17 percent of those interested in senior living said they felt it was too early to tour, they weren't sure their parent was ready, they were worried about costs, or the community was too far away to visit. But 57 percent of those who were interested in senior housing said they had gone on at least one tour. More than 80 percent had toured more than one community, and of these, 34 percent had toured 4 or more communities. Scheduling so many visits probably sounds like a lot of work. But it pays off in the end, experts say, because making sure a community is a good fit vastly reduces the chances your loved one will be unhappy and need to move again in the future. "This is a very big decision and older adults have strong feelings about where they feel at home," says Mary Kay Buysse, executive director of the American Association of Senior Move Managers. It may take time to make sure your parent is comfortable with a community before making a decision, but it's much more likely to be the best decision. Here are 7 ways that touring senior living communities will help you find that perfect match for your loved one. More than anything else, it's the feeling or atmosphere of a senior living community that finally tips the scales, and it's not easy to get this gut feeling without personal experience. "What feels comfortable for one person is very different than for another," says Mary Kay Buysse. For example, what feels like a happy, active, energetic place to a person who likes a social environment may feel loud and chaotic to someone who prefers peace and quiet. Then there's that hard-to-define feeling of being in a place that feels comfortable and familiar. Said one caregiver surveyed, "I found the feeling of homey-ness wasn't evident until I visited. Reading reviews and talking to staff only gave me the basics, but the visit really sealed my impressions." Among the criteria important to family caregivers looking for senior living, staffing is always a top priority. For the best of reasons; you want the finest possible people caring for your parent or loved one, as way you would do yourself. But it's not all about qualifications, though those are important. Just as important are qualities like empathy and kindness. Watching staff interact with residents gives you important clues about how much they listen and really hear what residents are saying. "Do the staff stop and greet and chat with every resident when they pass them in the hallway or outside? That's what you want to see, says the COO of a Colorado senior living facility. For many family caregivers, seeing the attention and concern exhibited by staffers was the deciding factor in making a choice. "The personal care and contact is extremely important for my mother and me," said one Caring.com member. "She was spoken to directly and with the utmost respect." The number of residents, number of rooms, and other measures used to describe the size of a facility don't tell you as much as you might think about whether it's "big" or "small," experts agree. A small community with a maze of poorly lit hallways can seem large; a well-planned large community with plenty of common spaces and open access can feel cozy and intimate. Make sure your tour takes you into the residential areas, and see how it feels to walk there. Do all of the rooms or apartments have relatively short, easy routes to the dining room and other central facilities? Are there rooms or units that feel isolated, stranded at the ends of lonely hallways? In a community with detached living units, is it easy to get to the central complex? Are there covered or enclosed walkways, golf carts, or other aids to help residents get around, particularly in bad weather? Are there enclosed areas with plenty of windows and light where residents can enjoy the garden view when they can't go outside? On this one, all experts and caregivers agree: Good, tasty, nourishing food is essential, and beyond that, the extent of the menu matters too. Some older adults can't see far beyond meat, potatoes, and other hearty American fare, while others are used to eating food from all over the world. There needs to be enough variety to please all palettes. It's also important to check that the kitchen caters to any special dietary needs, from diabetic and heart-healthy to vegetarian, vegan, and kosher. We all know when we arrive somewhere and feel like we're among our "peeps," and the same is true for your parent or loved one. While you don't necessarily want a homogenous group and your parent doesn't have to like everyone, you want to be sure he feels he's in a like-minded community with plenty of potential new friends. Eating a meal during your visit is one way to interact with residents; joining in an activity is another. If striking up a conversation with strangers isn't your thing, ask staff to introduce your parent to a few of the residents. With all senior care communities offering a calendar of activities and events, it's easy to overlook differences in programming, which can be significant. Some communities restrict activities primarily to those held onsite, while others schedule numerous outings or bring residents into the community to volunteer or take classes. There's also great variety in the kinds of physical activities offered. While visiting, take time to read through the next month's calendar with your loved one, and ask if the activities and classes offered are the kinds of things she would do. 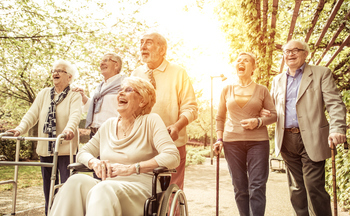 Yoga and dance classes are wonderful, but if your loved one prefers long walks, you'll want to make sure the grounds are extensive enough for that, or that residents have a way to get to local parks. If possible, ask to see an activity or class in progress. What's the teacher or activity director's style? Is it direct and respectful or patronizing? "You want to make sure the activities offered don't just feel like busy work, because that can be demeaning," said the senior living COO. "It's important to ask what their philosophy is -- are these activities just to entertain, or to enrich their lives?" Give some thought to the way your parent or loved one lives now and what's important to her. Chances are, you'll come up with a few specific things that, if available, would make life in a new community much happier for her. Maybe she likes it when you visit with your dog, or she always has a midnight snack; will these be possible? Or she's allergic to certain foods, cleaning products, or soap and beauty products; can the facility accommodate these needs? Not only will the answers address your specific concerns, they'll also tell you a lot about this community's style and how flexible and open they are to accommodating residents' wishes. Above all, you want your loved one to feel heard. For a detailed guide on what to look for, and what to ask while touring assisted living communities, see the Assisted Living Checklist.